To many people, nothing is exciting and enjoyable as spending several hours of your day kayaking. You’ll not only love the workout but also enjoy the view of nature while paddling. However, the possible downside to this activity is holding the kayak paddle for long. The end result is often hand blisters and calluses associated with paddling. It is due to this that kayak paddle grips were incepted. They are a good alternative to kayak gloves that can be used for both summer and winter seasons, unlike gloves, which heat up during summer. Kayak grips solve the issues associated with paddling with bare hands. Therefore, the best product should be comfortable, lightweight, easy to install and remove and extra lightweight. With numerous designs present in the market, our kayak paddle grip review below outlines some of the best products you can consider for your paddling escapades. 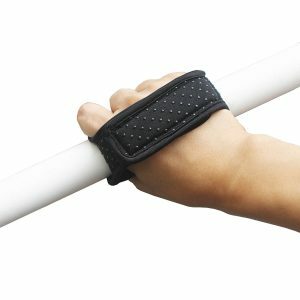 If you are looking for the best kayak paddle grips that prevent blisters and calluses, the Cascade Creek Yakgrips is an ideal choice. They feature the cushiest feel and are soft and comfortable to facilitate paddling on long trips. These grips follow the actual curve of the hand thus reduces fatigue besides offering protection. They offer protection by easing pressure on the palms and tendons. Installing and removing the Cascade Creek Yakgrips is quite easy. To install them, wet the inner gripping design and slide them on the paddle. They will remain in the position you left them. Removing them is also a breeze. Simply put some water on the paddle shaft and pull them off. The Universal Kayak Paddle Comfort Grips are versatile grips that can effectively function as kayak grips as well as SUP paddle grips. They are made of 4mm neoprene that expertly prevents calluses and blisters. Perhaps the highlight of these kayak paddle grips is their water resistant feature. They will hardly soak in water and wearing them is a matter of slipping them over your hand. They have silicone pads that hold the grips in place. The neoprene material is also anti-slip, perhaps an addition to their firm action. Lastly, they can fit all hand sizes as the grip adjusts to any size. If you are in the market for paddle grips that suit both your kayaking and canoeing needs, consider the KAPCO HoldFast Kayak and Canoe Paddle Grips. The package contains two black 6-inches grips that enhance hand placement and comfort. 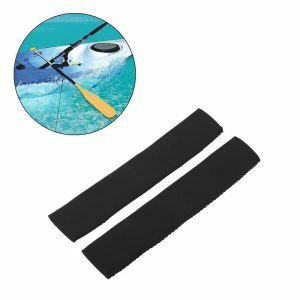 The grips are perfect not only for kayaking and canoeing but also other water sports that have paddles ranging from 1” – 1 1/8” shaft diameter. They provide efficient padding that prevents common blisters and calluses. The Vbestlife Kayak Paddle Grips are perhaps the best-constructed kayak paddle grips. They are made from high-quality material that is durable, soft and most importantly, wear resistant. Due to its quality make, it provides a comfortable grip that prevents the formation of calluses and blisters. It also features an anti-skid design that enables users to paddle smoothly and effectively. The grips fit shafts of diameters ranging between 2.7 – 3 cm. Installing and removing them is also easy. Finding the right paddle grip in this product stuffed market can be quite daunting. Similarly, deciding which grip is better than another is purely personal preference. Whereas some people prefer grips that offer total coverage, others would like to feel more of the paddle in their hands and fingers. However, when searching for one, take into consideration the following factors. 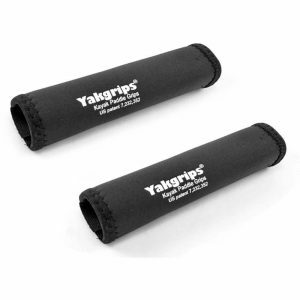 Price – kayak paddle grips are available in varying price ranges. This solely depends on the material make or design and other aspects. Find an affordable paddle grip that gives you value for your money. Color – paddle grips are available in various colors. Making a choice of color is a purely personal choice. 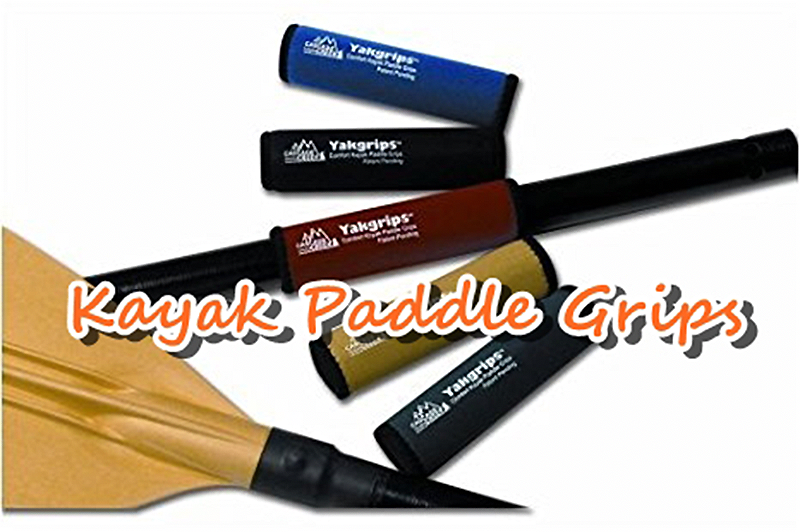 Weight – heavy kayak paddle grips will hinder your maneuverability, especially during paddling. Therefore, consider a lightweight paddle that protects your hands as well as enhancing your paddling efficiency. Paddle grips function just like kayaking gloves but with little difference. Most of them have Velcro closed on the back of the hand and fit across your palm. Finding a suitable model requires that you search widely. The best, as mentioned, should be comfortable, lightweight and affordable. It should provide a guarantee of preventing common kayak paddling associated blisters and calluses. From our kayak paddle grips review above, which is your favorite? Share with us below!